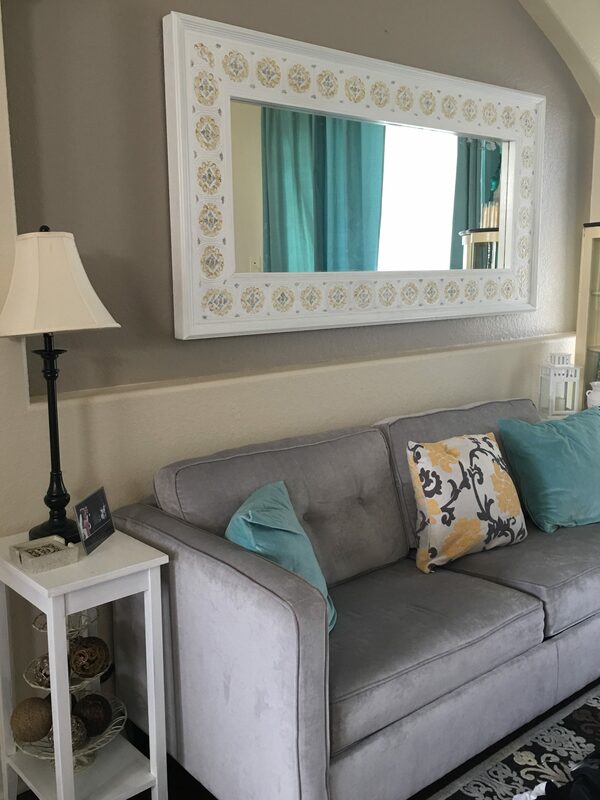 When we first moved into our house, we decided to purchase a rather large Ikea mirror to add some decor and functionality to our master bedroom. However, it wasn’t long (a few short months) to which I decided the mirror needed to go and be hung in our dining room over a buffet. While I love it there, and it was nice that year for Christmas, it was not its forever home. 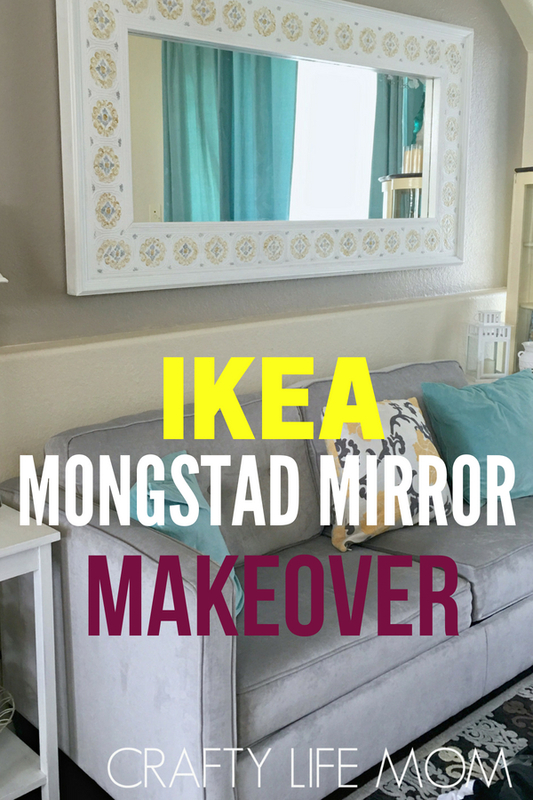 If you have seen the $99 Ikea Mongstad Mirror, you know that it is no small lightweight thing. In fact, the Ikea mirror is quite large and heavy. Moving it around is hard. LOL, for hubby anyway. And to hang it needs some pretty heavy duty anchors into the wall. When you remove the mirror, the anchors can leave huge holes. It is no easy decision to move this thing. Yet, I have a few times. So, after that first Christmas in our home, we bought some really nice dining furniture that included a china cabinet. Out with the old. Therefore, the mirror had to move, again. And, it has moved since then at least once more to its final place. However, before that final move, I gave it a makeover. 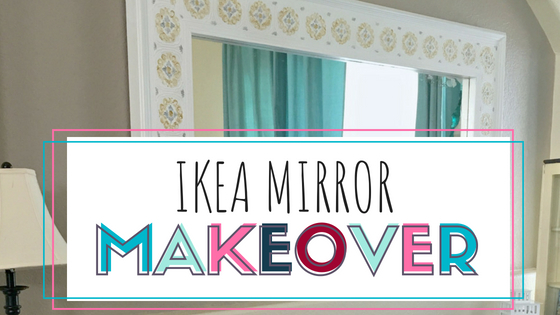 The Ikea mirror makeover was fairly easy to do. In fact, I was a few months pregnant when I did this project. And came across these pictures and decided to share this super easy DIY with you. I managed to take a before picture. I was not even blogging back then, but this is what I did when I did any DIY projects. I’d take a before, during and after photo, lucky for me I am now able to share them. It’s like my inner being knew I might blog one day. I purchased a border paper that I loved the design of – here is one very similar. It was a standard border paper, not too expensive and I believe came from Home Depot. 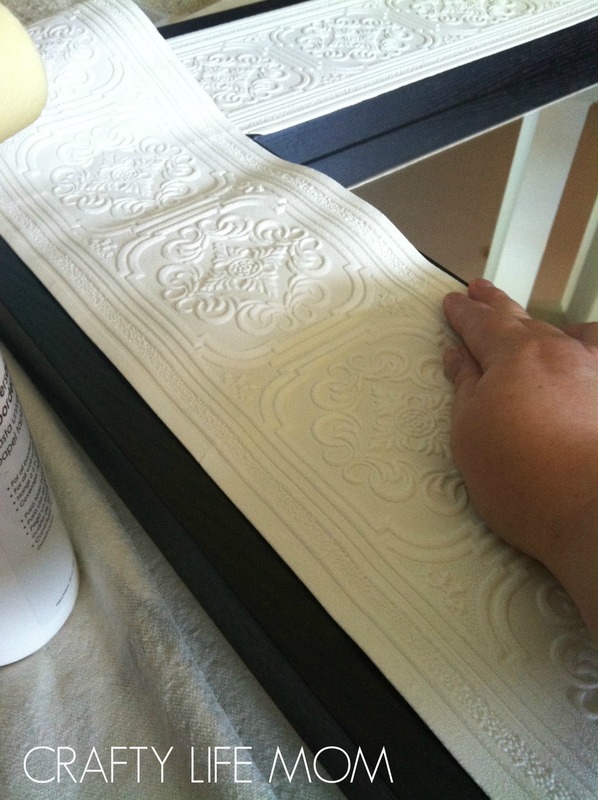 The border paper was pretty wide and had raised embossing on it, which I completely loved. It was more of a pattern I was going for. I wanted this mirror to have a more traditional look as opposed to a modern look. I measured the border paper to the length of and wide of my mirror leaving excess to cut the sides. The hardest part was matching the paper to the corner while also cutting it at an angle. Cutting the border at an angle allowed for the best match possible with having to fold it under making it uneven. 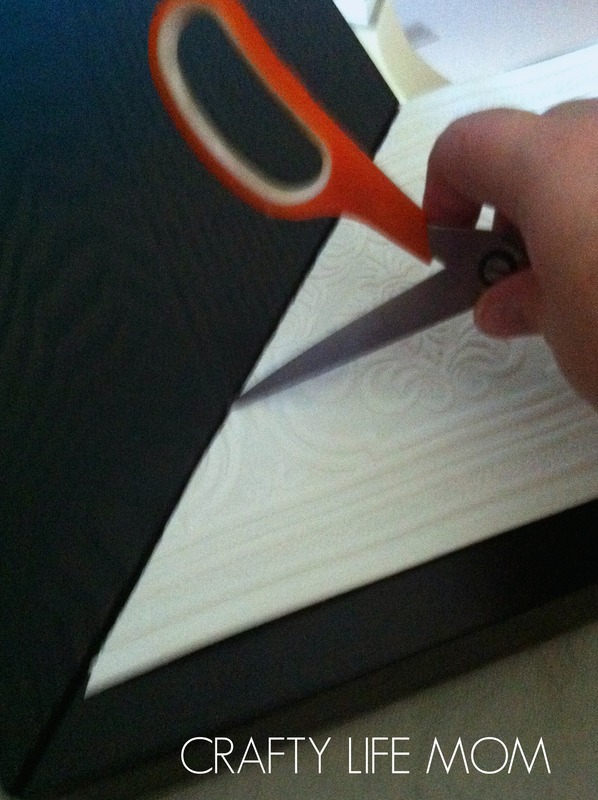 The mirror frame was already cut at an angle for the corners, so this helped me to score the paper and then cut it. Any access, I tucked into the seam or crack of the frame. To hold the paper in place I used wallpaper glue I also got from my local department store. You can probably use mod podge if you decide to do this project yourself. Any glue or adhesive should work fine. Just make sure you are generous with it. Since my border paper did not quite cover the entire width of the frame, I decided to add a small piece of molding to the edge to frame off the mirror. This was my husband’s idea. It really saved the day, as I didn’t really consider measuring the width of the mirror before I purchased the border. It was something I saw, and sort impulse purchased the border paper creating an impulse project idea. In my defense, I was pregnant at the time. LOL. I measure and plan much better now. Once the border was added, I finished the mirror by paiting it white. 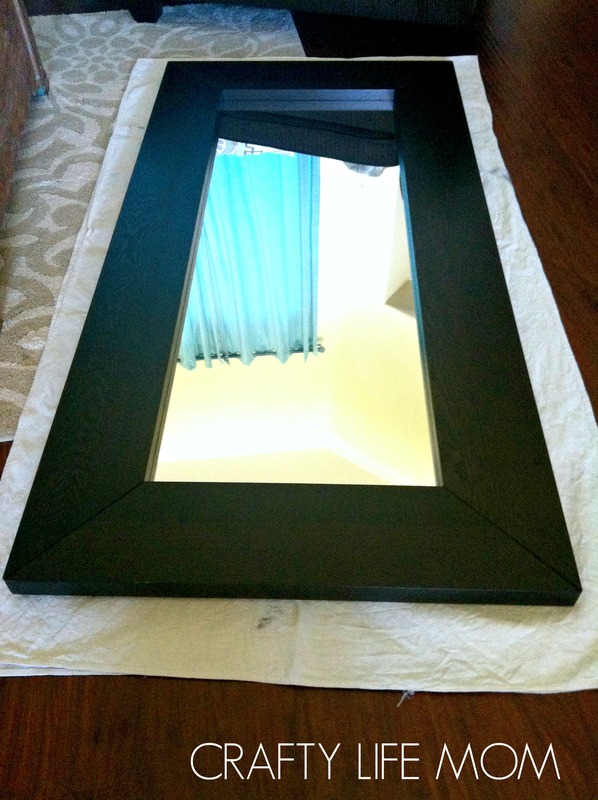 I did this so the black/brown edges would go with the rest of the frame of the mirror. It took two coats on the size to get a bright white shade. Lastly, I took a little bit of gold and silver acrylic paint and dabbed it on the embossed edges all around the mirror to give it an antique look. My antiquing technique was the paint was very random and not super consistent but I really love the way it turned out. I really like how it is not such a dark object hanging in my home. And for a few bucks, this was a really inexpensive makeover to complete.